GIZGUIDE's last minute Christmas tech gift ideas! Home / accessories / features / news / GIZGUIDE's last minute Christmas tech gift ideas! Need ideas for last minute Christmas gifts? We have all been there and done that. Do not worry because GIZGUIDE got your back. Here are 10 tech gift ideas! 1. Ekobuds Lifetones 2 / Ekobuds Go - Ekotek has a lot of headphones in their line up. However, there are two that stand out. First of all, there is the Ekobuds Lifetones 2. These are affordable in-ear monitors that offers great build quality and huge sound. It is available for PHP 299 (sale price). It also available in a lot fun colors which makes it very stylish. If you are looking for a sporty Bluetooth headphones, then the Ekobuds Go is the one you need. At its current sale price of PHP 1,176 from PHP 1,479, these are a great pair of wireless in-ear monitors. It is sporting a matte black finish that looks and feels premium. It is also IPX4 certified for water and dust resistance so you can definitely use it. It also has a 4.5 hours of continuous playback battery life. 2. Ekonic Justice League Headphones - The Ekonic Justice League Headphones is a great gift for both music fans and DC Comics fan. They sound great (for the price) and the custom colorway for each JL member is a great touch as well. It is now going for only PHP 849 sale price. Anyway, it has Qualcomm's Quick Charge tech and VoltiQ for those who need a fast charge. It has two charging ports, a 4-LED light indicator and a very portable build. 4. Tronsmart W3PTA 3-Port USB Wall Charger - Limited in wall sockets? At PHP 819 in Lazada, the Tronsmart W3PTA 3-Port USB Wall Charger can allow you to charge 3 devices using one wall socket. 2 of the outlets are outputting 5V/2.4A and the other one has Qualcomm's Quick Charge 3.0 tech. No more fighting over the last remaining electrical outlet. 5. ADATA HD720 1TB External HDD - If you need more storage the the ADATA HD720 external HDD is the one for you. At PHP 2,999, it has 1 TB of storage. It is also shockproof, dustproof and waterproof. It has an enclosure with three layers of protection including G-Shock sensor protection. It is also available in 3 colors which are blue, black and yellow. 6. XPower 3-in-1 High Speed USB Cable - XPower has a solution for your messy cable problem just for PHP 1,490. It is a 1.2 meter 3-in-1 Aluminum Alloy Cable that is Apple certified. The cable itself is very durable as it a nylon cable. It has USB Type-C, Micro USB, and lightning connector. It also has support for Quick Charge 2.0 and 3.0. 7. Baseus Products - We can't pick any specific products from Baseus as they have everything in terms of smartphone accessories. 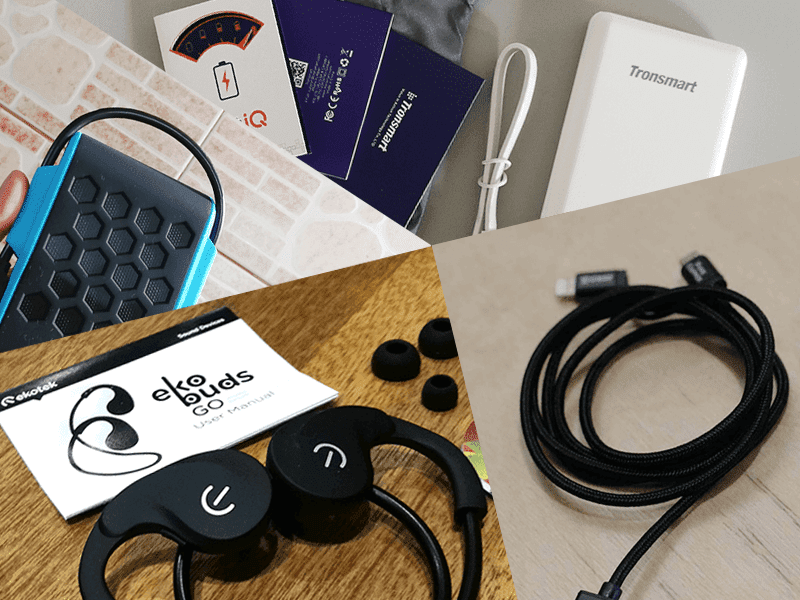 They have powerbank cases, wireless speakers, quality USB and Type-C cables, Hi-Res certified In-Ear monitors with prices starting as low as PHP 990. 8. Xiaomi Mi Band 2 - The Mi Band 2 is a great fitness band from Xiaomi. Its price is playing from PHP 899 to PHP 1,499 depending on promotional sales. It is IP67 certified in terms of water and dust proofing. It has OLED screen that displays your progress and the time. It compatible to iOS and Android. 9. Sandisk OTG drives - Having a USB drive that can both connect directly to a computer and a smartphone is becoming more essential nowadays. The ability to bring your files and access it instantly is something that is very convenient to have. Sandisk has OTG drives varyoing size and prices. Depending on the size and type of the OTG drive you want sizes will always start at 16 GB up to 128 GB while prices can start from PHP 699 to PHP 7,999. 10. Joby Gorilla Pod - A gorilla pod is something that any vlogger or photo enthusiast should have. It gives you very versatile tool as it can be a tripod, a monopod and even grab onto things, hence the name, gorilla pod. It is available at Digital Walker for PHP 2,490.